As I look back on my life, there are many moments that bring a smile to my face and more than my share that cause me to grimace. There are even a few that make my eyes a little moist. Time has made it easier to picture the past by smoothing over many of the rough edges. As much as I would like the opportunity to rewrite history, that's not going to happen. I have accepted my past, warts and all. I'm actually proud of it. It's no more perfect than I am. Yet along the way, I think that I've learned a lot and ended up a lot better person than I was at the beginning of the journey. Perhaps that's what it's all about, crossing paths with others who help us to become someone better than our previous self and at the same time leaving everything a little nicer for our having been there. There's no question we make lots of mistakes along the way. If we try really hard, sometimes we can keep our errors to a minimum. Though more often than not the problems we create are mostly unintentional. Yet the truth is that most of the time we muddle onward even with the errors. Sometimes we have some grand victories, and they are often balanced by some equally grand disappointments. Perhaps what keeps us going is that tomorrow is another day that needs to be experienced. Maybe in that one day we will do something special than reminds of us of our own humanity. Touching that humanity reminds us that we can rise about ourselves, and perhaps the long journey was worthwhile in spite of the challenges and disappointments. 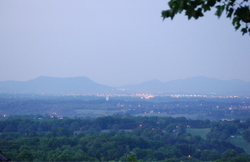 The clouds have cleared here, and there is hope that tomorrow morning I might get to see yet another glorious sunrise over the Roanoke Valley. If luck is with me sometime after the sunrise tomorrow, I might have a few minutes to reflect on the past. Just maybe the memories will run clear for a few pages. I'm not kidding myself that those memories will be of great value to the world. They may be of passing interest to those who have known me or been part of the journey. Yet perhaps someone might glean a few words to help them along the way. In the end that just might help to make it worthwhile.